Sometimes it´s hard to sleep. When travelling whether for work or even for leisure the change of environment, the unusual noises in unfamiliar surroundings or even the different pillow from your own can make it difficult to doze off. Last year I visited Alicante, I was on my way to pick up my family from Alicante airport to go on a holiday at the Costa Blanca nearby. As the journey from Granada to Alicante was going to take quite a few hours to stay over night in Alicante so that I would begin my holiday relaxed and could get to the airport by 12 noon without having to get up in the middle of the night. 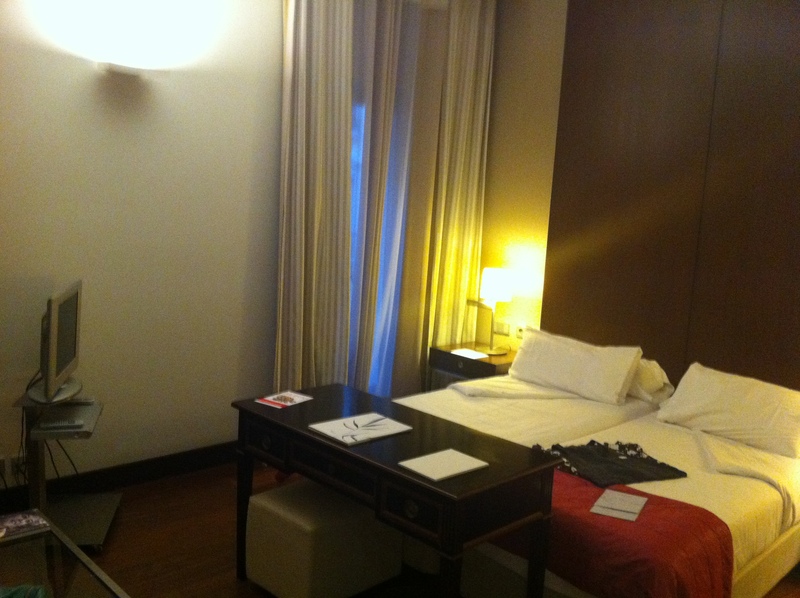 I chose to stay in a Hotel in the city centre. I got a great deal on the room, breakfast was included. When I arrived I was really happy with my choice. It turns out that the hotel chain run an initiative each year to help their customers to sleep well which coincides with the World Sleep Day – 16th March each year. So on arrival to my comfortable hotel room (pictured above) at the Hotel Hospes Amérigo I found information about their Dreams project. This entailed many different things as well as a book with poems and prose to help you to relax before falling to sleep, they also offer special menus in their restaurants which are specifically selected ingredients that relax the body. 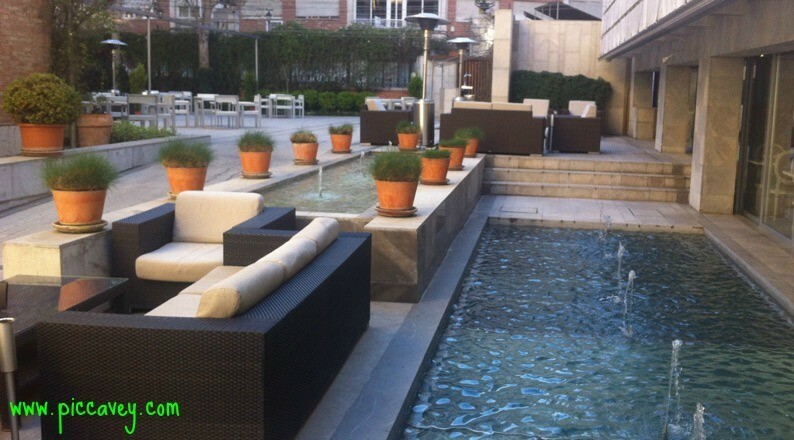 They also have beauty treatments and a Spa which offers specific treatments which help you sleep and rest your mind. The food selected for the Dreams menus are rich in magnesium, potassium and iron which are minerals that have a proven relaxing effect. Complex Carbohydrates and Vitamin B also feature. I just had to try this myself! I found out that this Dreams menu is available in several restuarants in Spain: Cordoba, Granada, Madrid, Mallorca, Puigcerdá, Seville and Valencia. 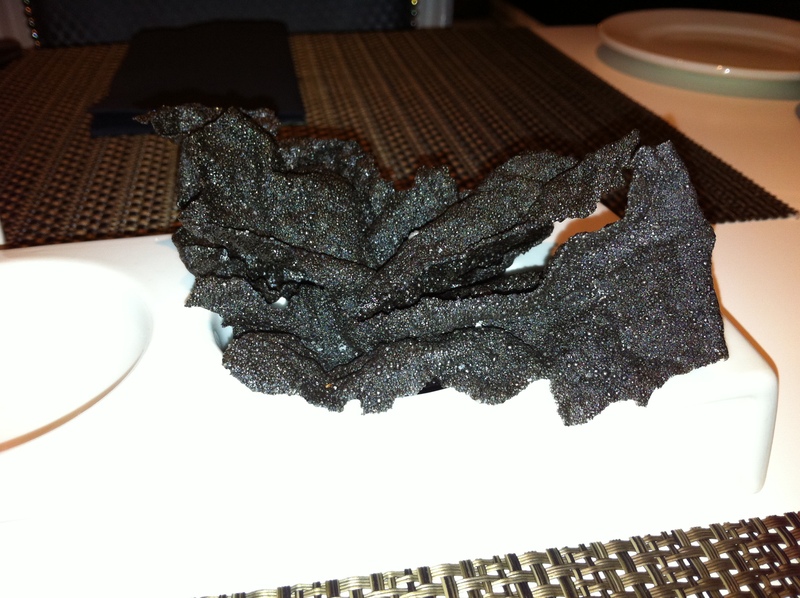 Aperitif of crunchy Black Crackers with Squid ink. 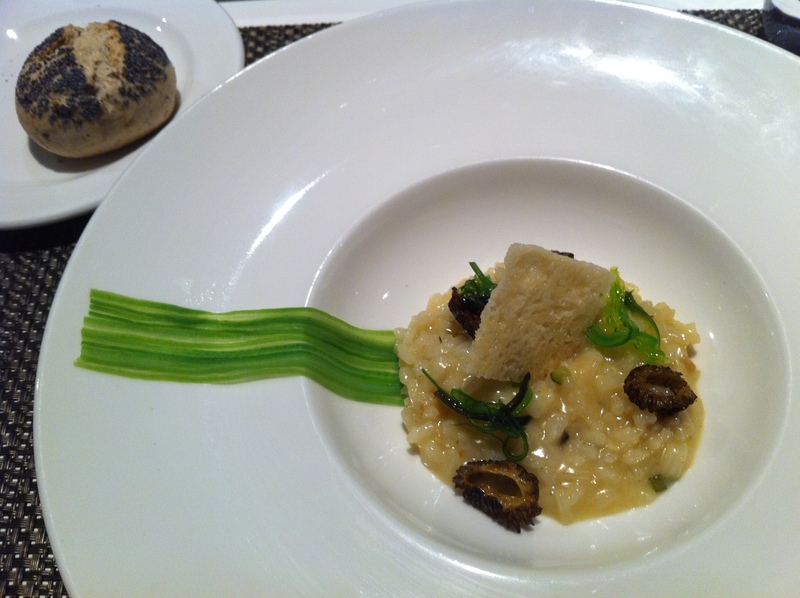 The starter that I chose was Risotto of Vegetables and Seaweed. Pictured below. The presentation is immaculate. The seaweed on top is wakame and the decoration are tiny strips of green beans. It was as delicious as it looks on the photo. The flavour of the dish was well balanced, not at all seaweedy or overpowering. The other choice of starter was their own modern take on the Alpujarra dish, a lighter version of the calorie packed traditional mountain food. Theirs included small pieces of red chorizo, fluffy mashed potatoes and a runny fried egg. Both include Complex Carbohydrates potatoes and rice which are indicated foods that can help to relax the body. The main courses I chose was Cod with a delicious tomato sauce and served on top of potatoes with green pepper. Fish contains vitamin B that helps the nervous system to function well as well as promoting relaxation. The cod was cooked to perfection, tender and white. 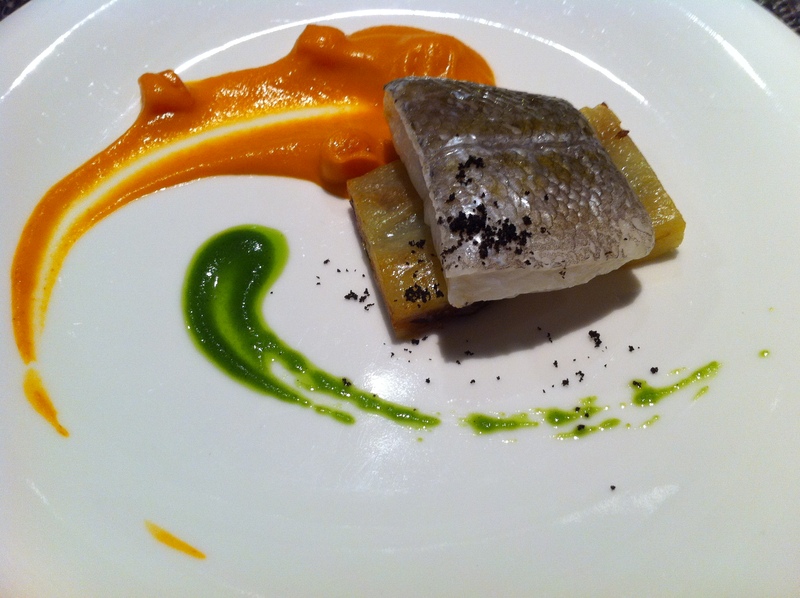 Again the colourful presentation of a ´grey´ dish was excellent. For me the best part of any dining experience is always dessert, you can take the girl out of England but not the english out of the girl! The choices were Vanilla custard with brownie and Belgian chocolate ice cream or Three chocolates with Raspberry sorbet. I chose the three chocolates and the raspberry sorbet and was not disappointed. 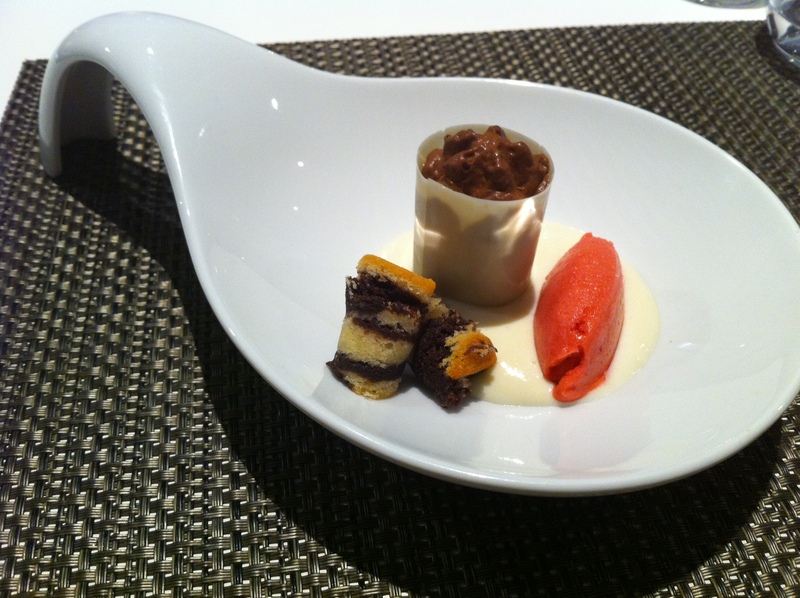 This was white chocolate sauce, like melted milkybars, with a tangy, fragrant raspberry sorbet, a roll of bitter Belgian chocolate mousse wrapped in a thin white chocolate roll and finally little sponge cakes with layers of truffled chocolate inside. Chocolate is rich in Magnesium and the dairy products included in this dessert are rich in Tryptophan which has a sleep inducing hormone. 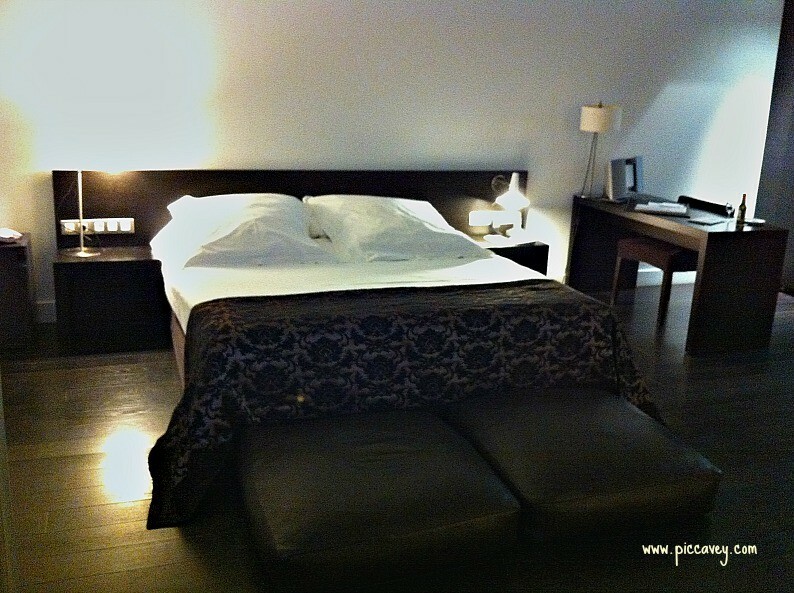 All the ingredients selected in the menu are chosen specifically to help promote relaxation and a healthy nights sleep. I must point out that drinks aren’t included in the price of the Dreams menu. I drank Lanjaron water with the food. Although to accompany the dessert I chose a Moscatel dessert wine to end with a flourish. This came in a magnificent bottle, I just had to get the picture. 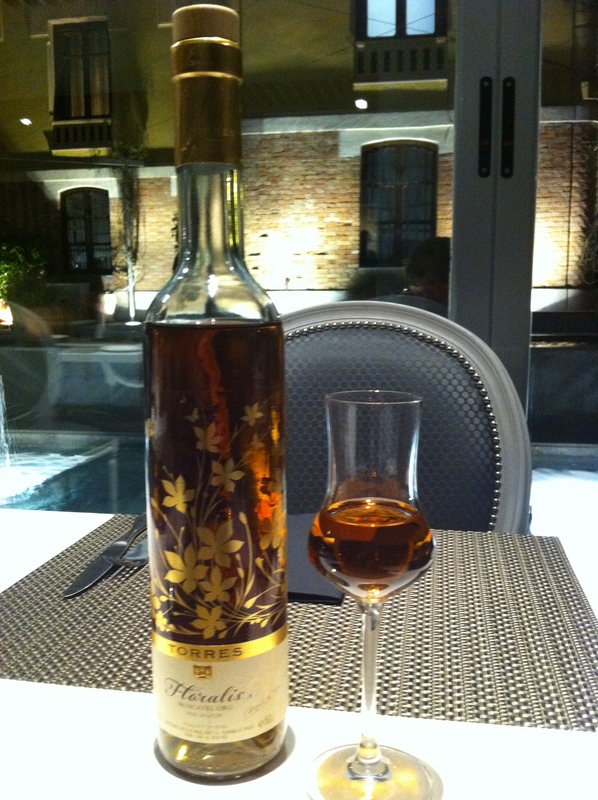 Moscatel Oro Floralis was offered to me, this has been in production since 1946. A rich golden colour with a sweet warming honey taste. This worked perfectly to sip whilst enjoying with the dessert. After this lovely dinner I went home to enjoy a great nights sleep. This menu is available during the month of March at lunchtime and in the evening, I would certain recommend dining in the evening unless you´re lucky enough to sleep siestas in the afternoon! In April, the menu will be changed for Easter week. ¡Que Aproveche y Buenas Noches! Rober Sears-Piccavey is SO right. Reading the blog and gazing at the food and wine photos leave me counting the hours until my next meal. Thanks for sharing these yummy images! This is why I enjoy living in Andalucia.